By Srinivas Chowdary Sunkara // petrobazaar // 12th April, 2019. 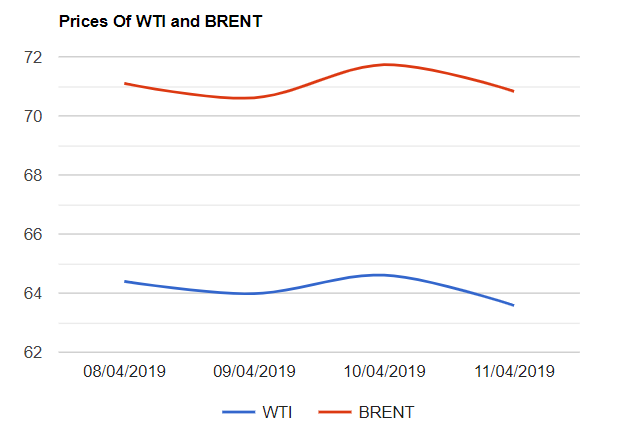 Brent prices dropped by 90 cents or $1.25 and WTI prices slid by $1.03 or 1.59% a barrel last night. Shanghai crude oil main contract rose by 4.4 Yuan or 0.92% to 480.1 Yuan/barrel while MCX crude futures in India shrank Rs.85 to settle down at Rs.4389 yesterday. The U.S crude prices were pressured by surging crude supplies and depressed cash grades while Brent futures were weighed on by suspected raise in OPEC production. The over all oil complex was dipped by accelerated selling in the session. Oil prices reached to five months high levels during the early week on tightening talk across the world and a surge in crude inventories were over shadowed by the gasoline drawings ahead of peak summer. IEA Monthly oil report has not changed the global demand growth for 2019 while indicating that the India and china will be main drivers of oil demand coming forth. This report also reported that the OPEC boosted the compliance rate to 153% after Saudi pushing oil supplies down to its two year's low levels. Today, Asian markets are opened in green. Good day to all.